This is the last of my Barry M Lip Paint features! Shocking Pink is THE ultra-hot blue-pink in a matte, opaque texture. You've heard this is a dupe for Candy Yum Yum (which I did not purchase), but a little more pigmented and intense. Shocking Pink is also dryer in texture than Candy Yum Yum or NYX's matte lipsticks, so make sure you pat on some lip balm and then blot off any excess product before applying this. 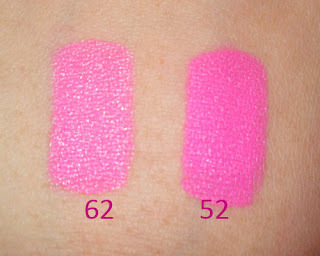 To better appreciate the brightness and "blue-ness" of the shade, I've swatched it next to a gamut of other "intense pinks". As you can see, NYX Cancun Pink does not even look bright compared to Barry M Shocking Pink. NYX Louisiana, which many consider a hot pink, looks very red beside its strong blue undertones. Revlon's Fuchsia is plummy in comparison, and NYX Shocking Pink looks almost mauve. If you are afraid of very blue or very bright pinks, feel free to check out one of the other shades listed depending on what you feel more confident wearing. I don't find any lip liner necessary as this matte lipstick has not bled. In fact, you'd be hard pressed to find any matching lip liner more intense and pigmented than this anyway. It also applies evenly, lasts for hours without touch-ups, and is one of the most incredibly unapologetic pinks you will find in the market. I don't like lipsticks staining, and this stains big time. But I experienced this with pretty much all hot pink lipsticks of this intensity. It's also not very moisturizing compared to other matte formulas like MAC Candy Yum Yum or NYX Shocking Pink. Then again, I have to say neither of those is this opaque and intense. Compared to other Barry M shades in my collection? I do find the texture of the 3 stronger lipsticks (Sunset, Vibrant Pink, and Shocking Pink) more even and high-quality than the lighter shades (Peachy Pink and Baby Pink) which take a bit more work to apply. The differences between Shocking Pink and Vibrant Pink are in the undertones (Vibrant Pink is more of a true-pick, and Shocking Pink more blue-based) as well as texture (Vibrant Pink is creamier). If you are afraid of wearing something that is too cool-toned, or don't like a very matte texture, go for 62 Vibrant Pink. Thank you both! Hope it helped you make some decisions!